I have a passion for scarves, the fabric can be so dramatic because its meant to brighten up a dull outfit. Sometimes the fabric seems too good to be hidden folded around your neck - it should be taking a centre stage. 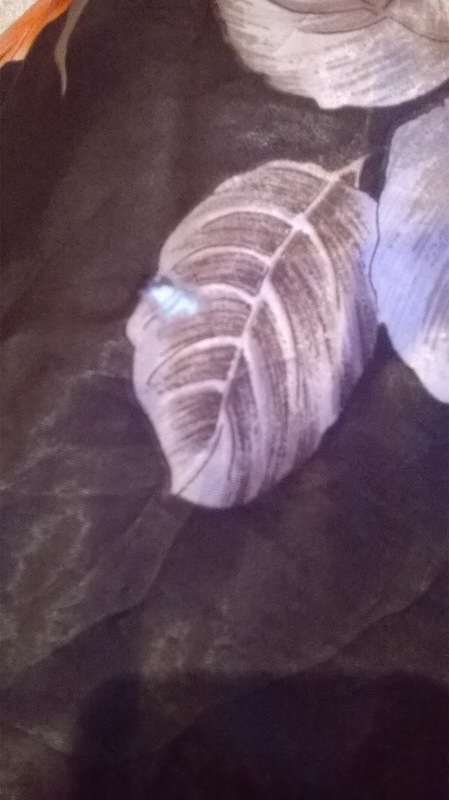 I mean, look at this one which I bought for only £1 at roundabout in Sheffield, a local charity shop. You need to see the whole picture to appreciate it. That's what was in my mind with my latest refashion. 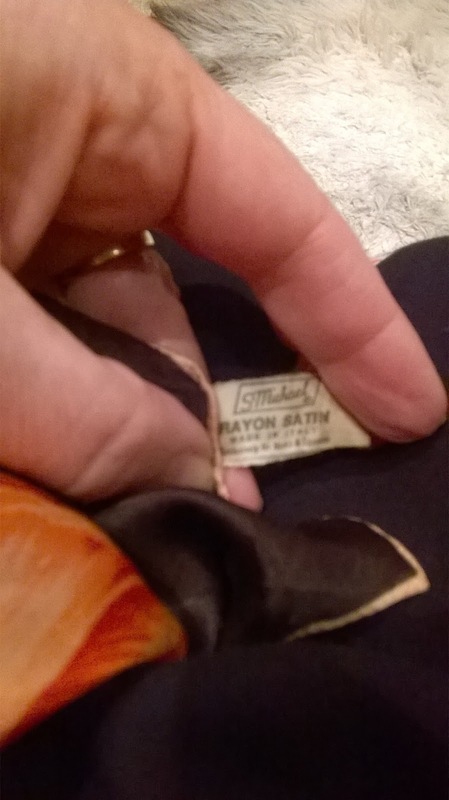 The label revealed it was a circa 1960's St Michael Rayon Satin fabric, made in Italy. 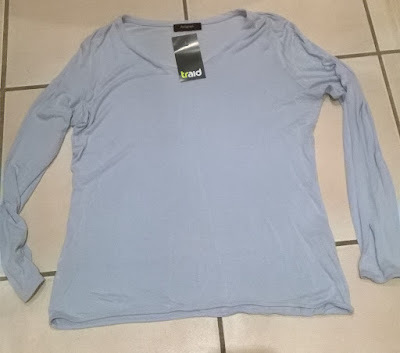 The second component of the refashion was a plain pale blue long sleeved top also from Marks and Spencer but from their modern Autograph range, and I bought it from traid in Brixton for £2. This shop normally sits at the upper end of the charity market selling vintage and higher end items at what I consider to be high prices, but they were having a sale and it looked like they had pulled out a number of less trendy items from the back of the shop and were flogging them off cheap. This top was made of 85% cotton, 15% silk fabric which was very thin and stretchy and the neck binding was a nice organza strip. 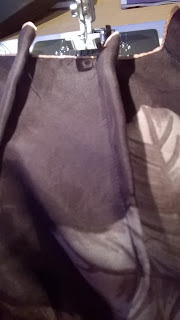 My idea, put simply, was to sew the scarf onto the front of the top in a flattering, stomach hiding (I wish) draped way. 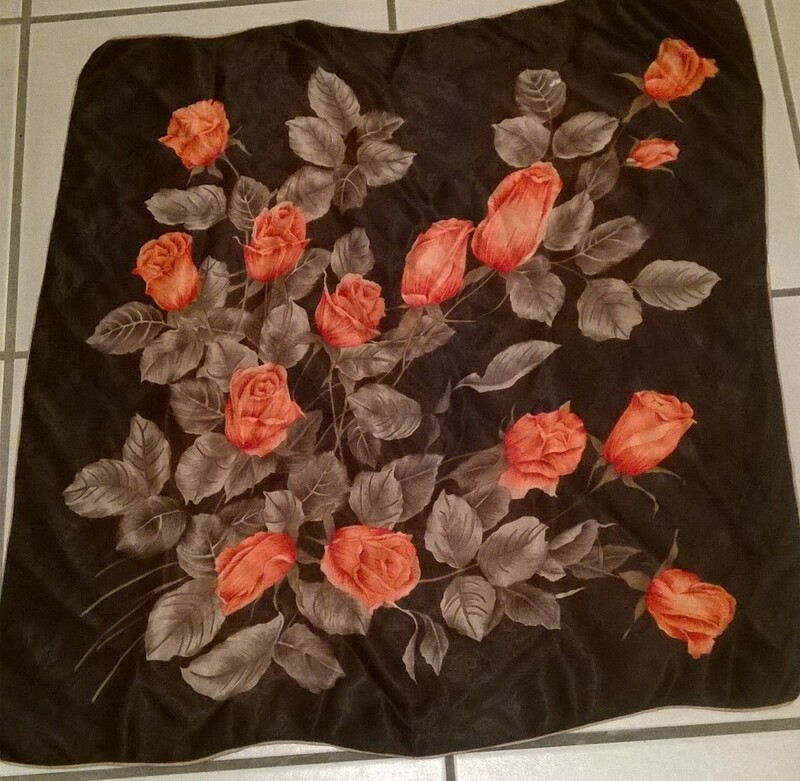 I don't really like interfering with a vintage item, but there was a small hole in this scarf. I had actually worn it as a scarf a couple of times as well, before re-directing it to refashion. The t-shirt fabric was thin and stretchy, the scarf fabric was silky, slippery and shiny and had no stretch whatsoever, so I had to find a way of combining the two which would work for both. 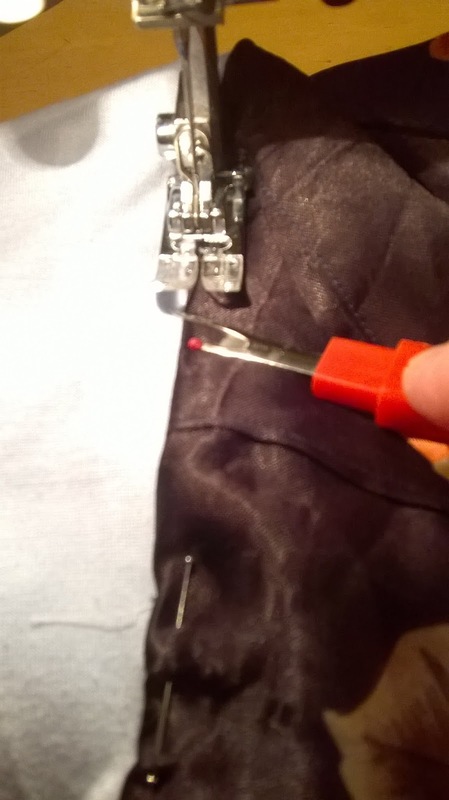 I spent a whole evening pinning tacking and trying on - a dress form would have come in really handy. In the end I just had to start sewing. I added some pleats and darts at the lower end of the sides, an idea copied from a top I already have. The theory was to add drape. 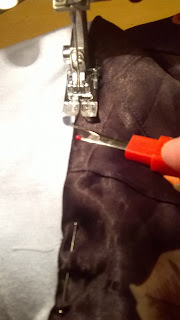 I kept using my seam ripper to hold everything flat and in place as I was sewing along. I didn't cut the scarf at any point, instead I folded it over, mainly because I was worried about fraying, but I doubt you could deconstruct this top and wear the scarf again. I left the armpit to neck section open to allow for stretch and movement in the base top. I quite like the way it looks a bit like a strappy top with a shrug. 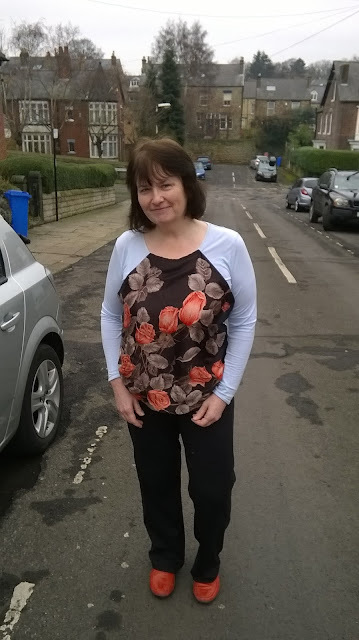 I have got a blog featuring this re-fashion here but I've put I decided I'd go for a full detail post on refashion co-op so there's not much point in heading over there unless you're interested in previous posts.